(CNN) -- Iranians wounded during protests are being seized at hospitals by members of an Islamic militia, an Amnesty International official told CNN. 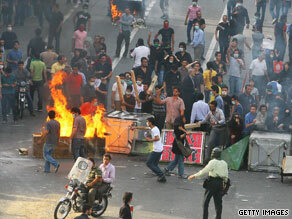 Ayatollah Ahmed Khatami says rioters in Iran will be "firmly" dealt with if they continue to protest. "The Basijis are waiting for them," said Banafsheh Akhlaghi, western regional director of the human rights group, referring to the government's paramilitary arm that has cracked down on protesters during the violent aftermath of the June 12 presidential election. Amnesty International has collected accounts from people who have left Iran and expatriates with relatives there who say the Basij has prohibited medical professionals from getting identification information from wounded demonstrators who check in, Akhlaghi said on Saturday. They are also not allowed to ask how the injuries happened, and relatives are hard pressed to find the wounded. Once the patients are treated, the militia removes them from the hospital to an undisclosed location, she said. The woman, who didn't want to be identified for fear of her safety, said she was injured in a rally, but was too scared to go to a hospital. Instead, a doctor came to her home to treat her. "The point is, when they are being taken to the hospital they don't actually get there," her friend who accompanied her told CNN last week. "Just like the reporters are being told not to report what they really see. Hospitals, administrative levels, are being told to stay out of the public because they're saying you're accusing the regime of being hostile." Blog: Punished mercilessly? Is this Islam? Amnesty International is also reporting the detention of at least 70 scholars and eight politicians -- most from former Iranian President Mohammad Khatami's administration -- in addition to several opposition activists and international journalists. More than two weeks into turmoil, Iran's leaders turned up the heat Friday as a high-ranking cleric warned protesters that they would be punished "firmly" and shown no mercy. "Rioters and those who mastermind the unrest must know the Iranian nation will not give in to pressure and accept the nullification of the election results," said Ayatollah Ahmed Khatami during Friday prayers in Tehran, according to Iran's state-run Press TV. "I ask the Judiciary to firmly deal with these people and set an example for everyone," Khatami said. Khatami also blamed demonstrators for the death of Neda Agha-Soltan, the young woman who emerged as a powerful symbol of opposition after her death a week ago was captured on a cell phone video. Khatami said the foreign media had used Neda for propaganda purposes. Human Rights Watch, citing interviews with people in Iran, said Friday the Basij is carrying out brutal nighttime raids, destroying property in private homes and beating civilians in an attempt to stop nightly rooftop chants of "Allahu Akbar" (God is great). The nighttime chanting is emblematic of the protests 30 years ago during the Iranian revolution, which toppled the monarchy of the shah. "While most of the world's attention is focused on the beatings in the streets of Iran during the day, the Basiji are carrying out brutal raids on people's apartments during the night," said Sarah Leah Whitson, Middle East director for Human Rights Watch. Residents from northern Tehran neighborhoods told Human Rights Watch that the Basij fired live rounds into the air, in the direction of buildings from which they believed the chants were sounding. Basij members kicked down doors and "when they entered the homes, they beat" people, a resident said. The rights group said it had collected similar accounts of violence from several other neighborhoods. Such accounts also are consistent with numerous accounts CNN has received of nighttime roundups of opposition activists and international journalists from their homes. Amateur videos sent to CNN also show members of the Basij, wearing plain shirts and pants and wielding clubs and hoses, dispersing protesters and beating a handful of Iranians at a time. Members of Iran's National Security Council have told Moussavi that his repeated demands for the annulment are "illogical and unethical," the council's deputy head told the government-run Iranian Labor News Agency. On Saturday Ahmadinejad slammed U.S. President Barack Obama, a day after Obama labeled as "outrageous" violence against demonstrators disputing election results. "Didn't he say that he was after change?" Ahmadinejad asked Iranian judiciary officials in a speech. "Why did he interfere? Why did he utter remarks irrespective of norms and decorum?" The National Security Council, which includes dozens of political leaders, assists Ayatollah Ali Khamenei, Iran's unelected supreme leader. Together, they set the parameters of regional and foreign policies, including relations with Western powers, and the country's nuclear programs. The Guardian Council, which approves all candidates running for office and verifies election results, has declared that there will be no annulment of the votes. However, it has reminded opposition candidates they have until Sunday to lodge any further complaints about the vote.